Canon and Nikon will be the dominance on reviews of this page. Of course not only because of they are popular, but also because they have a lot models or series that often make the candidate of users are being confused on choosing the right one on them. For example, Canon 6D vs 7D, you will have no worry anymore since there will be the review on the following below about the battle review. Full-Frame cameras so far just being a top-class camera dreams mostly fans of photography. Presence Canon 6D is spectacular and affordable change this phenomenon. Equipped with a Full-Frame CMOS sensor 20.2 megapixel with Auto-Focus (AF) 11 point focus and supported by WiFi and GPS as well as light weight 680 gr, Canon 6D became a full frame camera, sophisticated lightest in the world. Full-frame CMOS sensor excels in capturing the light better compared with the smaller sensor to minimize noise spots on shooting high ISO speed. ISO sensitivity owned EOS 6D has similarities with the EOS 5D Mark III the famous reliable in producing sharp photos even at extreme shooting conditions or in minimal light. To produce clear photos in all conditions, the ISO range owned by the 6D extends the width of 100-25,600 and can be increased again up to 102,400. Canon 6D also uses DIGIC image processor revolutionary 5+ that produces high-quality images primed even in lighting conditions that are very challenging though. Canon 6D can also do photo shoots with 4.5 speed streak photo frames per second. Canon 7D vs Nikon D3100 was the previous review that you can read as well. Enjoy it! Once again explained that the Canon EOS 7D a a tough camera in terms of speed, how not, this camera can do 8 fps shutter firing. When compared to the Canon EOS 5D Mark II only undertakes only 3.9 fps and for Canon EOS 5D Mark III only 6 fps. Canon 7D is equipped with a Dual Processor DIGI4, this makes the camera felt so quickly. In addition to Auto Focus is also considered so quickly. It is indeed truly Canon 7D designed to photograph with a quick style. With ‘window’ APS-C that looks like the 50D, the camera is certainly not featured 7 d same innards like a sister. Because in the body of the 7D has a double brain i.e. embedded Dual Digic 4 processors, with the AF point of 19 points, as well as a new mechanism that allows these cameras to perform continuous shooting about 8 frames/second rate. Consequently, this camera would have been more ‘ smart ‘ and fast in capturing an object, to result in capturing photo. Moreover, now the camera is provided with a kit lens EF/EF-S (1.6 x field crop) which is a little unsatisfactory, i.e. 18-135 mm. One thing which is a bit unfortunate, i.e. the camera is not yet full-frame. In addition to armed with wireless flash control, Canon also features full HD 1080 p video recording, with manual controls the lens belongs to the 7D, of course. Display problem for DSLR camera technology has Clear View II LCD display of 3 inches, and features a magnification of 1.0 x and 100% coverage viewfinder. 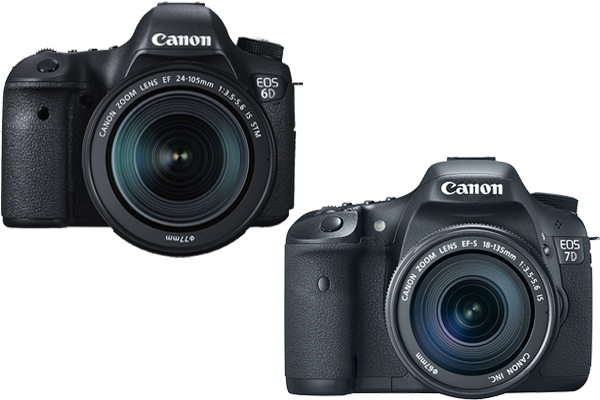 Canon 6D vs 7D may seem like similar cameras on paper but you know that they are different beasts. Canon 6D wins with ISO capabilities up to 102.800. While Canon 7D wins with ability to shoot at 1/8000th of a second and with Dual Card Slots. But, overall they are very good both. When you are deciding between Canon 6D vs 7D comes down to intended use.